Tall, stately female with elaborate tablita (headdress). Her arms and forearms are broken off. 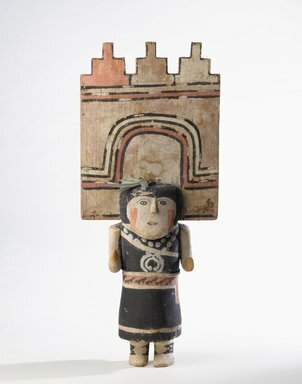 This complex Kachina may take on different personae. She may become Polimana, Butterfly Maiden, when she performs during the March Angl'wa dance ceremonies. Or she may be a troupe of four Corn-grinding maidens during the same ceremonies. Both performances are prayers for rain and bountiful harvest. Lastly she can perform a special dance anytime if sponsored by a kiva.